I think there are two significant aspects to the idea of "covenant" in covenant theology: headship, and reliability. As mentioned in my previous post, covenant theology revolves around two covenants: works with Adam, and grace in Christ. Both Adam and Christ are representative people. They represent all those associated with them. They are their "head". Whatever happens to the head, happens to those associated with them. Adam represents all humans: so when he failed, we all failed. Christ represents the elect: his death is therefore our death; his resurrection our resurrection. This is the federal headship aspect of covenant theology. 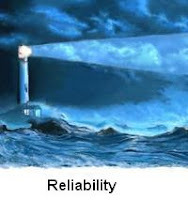 The other aspect is reliability. A covenant binds someone to perform certain actions. It is therefore a basis for faith. Faith only works if the person whom you trust is trustworthy. One way of demonstrating trustworthiness is to make a covenant, where you bind yourself to do something. This aspect of covenant theology is both powerful and dangerous. It is powerful because it helps explain how God demonstrates he is reliable. Christ himself, in his death and resurrection, is the mediator of the covenant of grace. "God demonstrates his own love for us in this: While we were still sinners, Christ died for us" (Romans 5:8). It is dangerous because it lends itself to the legalistic thinking that I acknowledged, in my previous post, was a danger in covenant theology. It's easy to think we "give" God something - faith in Jesus - to "make" him give us something in return - eternal life. Covenant theology has always disowned this neo-legalistic interpretation; but it's still a danger. Is there a way of retaining the headship and reliability aspects of covenant theology, while getting rid of the danger of legalism? I dunno - what do you think? Habits of Evangelically effective ministers?